Minor League Baseball is filled with individuals who have dedicated their lives to the sport, but very few are able to rise to the level of prominence and influence that was achieved by longtime South Atlantic League president John Henry Moss. He was, quite simply, a titan of the industry. 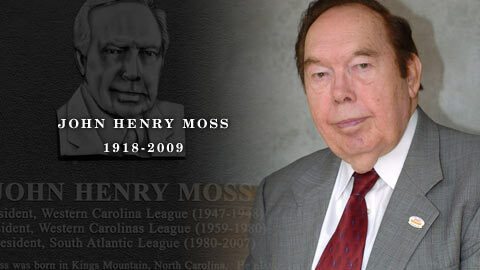 Moss passed away Wednesday in his hometown of Kings Mountain, N.C., at age 90. His career in professional baseball dated back to 1947, and he served as the president of the South Atlantic League from its inception in 1959 (as the Western Carolinas League) through 2007. Moss transformed a regional four-team circuit into a far-flung Minor League powerhouse over this period of time, with invaluable help from his beloved wife. (Elaine Beilke Moss served as the league's director of administration and finance for 45 years, until her death in 2004). The South Atlantic League currently boasts 16 franchises spread out over eight states, and half of these clubs play in facilities constructed in 2001 or later. "He knew more about what mattered to our fans than anybody in our business," said Lexington Legends president Alan Stein. "He was instinctively aware that the game was to be respected, but at the same time he realized that baseball at the Minor League level is all about the fan experience. That's everybody's mantra now, but it's something he had been saying for the past 60 years." As chairman of the South Atlantic League's personnel committee, Stein was in charge of appointing Moss' successor. The job went to Eric Krupa, who was deeply appreciative of how well-positioned the league was for success in the 21st century and beyond. "John was a determined man, and always able to survive the lean times," said Krupa, who had previously worked in Minor League Baseball's central office as a director of business and finance. "I always made sure to take advantage of his wisdom and experience, and whenever I had an issue with anything, I knew that I could always run it by him." After stepping down as president, Moss assumed the title of President Emeritus and continued to work on a wide variety of projects (including the establishment of a permanent location for the league's Hall of Fame). He remained active and involved until suffering a stroke on June 7. Minor League Baseball president Pat O'Conner, who has risen to his position after spending nearly three decades in the sport, expressed amazement at Moss' longevity. "When I got into baseball, he was already 60 years old," marveled O'Conner. "But yet, he was always a leader and always at the forefront. He was talking about the benefits of the internet and streaming video before most of us had ever heard of such a thing. "[Moss] plowed the field we toil in today. He fought the fights and won the wars, allowing guys like me the opportunity to have the experiences we've had. He always understood the need for solid ownership and good management." Much of Moss' success within baseball can be attributed to the fact that he was a consummate politician. He served as the mayor of Kings Mountain from 1965-88, and earned the nickname of "The Mayor with the Midas Touch" (from Newsweek magazine, no less). "He was able to get more money from Washington than the U.S. mint," said O'Conner with a laugh. "To me, the most amazing thing about him was his body of work as a mayor." Pacific Coast League president Branch Rickey III, with great affection in his voice, characterized Moss as "very deceptive." "You could never tell what he was doing, because it always looked like he was idle," said Rickey. "He was never rushing anywhere, never frantic, never visibly distraught by anything. But despite this, he was always prepared and never ran out of options. "When it came to conflicts, he was so effective at culling the incidental and superfluous, at boiling down an issue until it was something that everybody could focus on. I don't think it was an accident that he was so revered in Kings County, totally apart from everything he accomplished in baseball." Moss' association with the Rickey family spanned three generations. As a young man trying to establish the Western Carolinas League, he received assistance from legendary baseball executive Branch Rickey Sr.
"The league was down to three teams, and [Moss] was trying to get a fourth," recalled Rickey. "He and my grandfather traveled through North Carolina together for several days, talking with city leaders." While Rickey III didn't recall the exact circumstances that prompted this fortuitous relationship, he was sure that Moss' uncanny networking skills had something to do with it. "As I remember it, John and my grandfather had a friend in common," said Rickey, laughing at the memory. "Through that he got an introduction, and all John Moss ever needed was an introduction." One of Moss' colleagues in the early days was Murray Cook, who served as a general manager in Gastonia, N.C. before moving onto a distinguished front-office career in the Majors. "When I was in the [Western Carolinas] league as GM, no city was more than two hours away, and we commuted every trip," said Cook. "Now that league is all over the place. A lot of guys, as they get older, become intolerant and entrenched in their views. But John always managed to keep up with the times." It is for this reason that Moss' impact will be felt in the South Atlantic League, and Minor League Baseball in general, for a long time to come. "When you think of his name, you can't help but smile and get a twinkle in your eyes," said O'Conner. "I called him Mr. Mayor, and I called him Mr. President, but what I'll always treasure the most is that I was able to call him a friend." Benjamin Hill is a reporter for MLB.com. This story was not subject to the approval of the National Association of Professional Baseball Leagues or its clubs.